Superior Ionic Colloidal Silver * "The best ionic silver available, period." 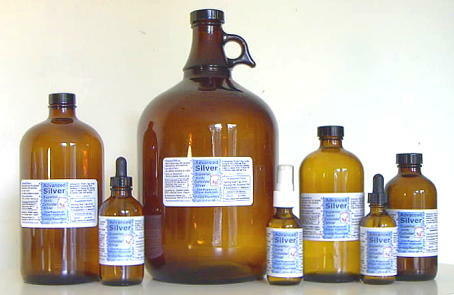 Ionic-colloidal silver is a combination of both ionic silver and colloidal silver. Research shows that it's the ionic silver water which produces the greatest results, but both forms have desireable effects. So we produce Advanced Silver with the benefits of both. Our Advanced Silver is 85% ionic silver and 15% colloidal silver, the perfect combination for most silver supplement uses. Advanced Silver is simply the best liquid silver colloidal available. *For more information about the benefits of ionic silver read Third-Party Research. Advanced Silver is sold for internal use as a dietary supplement. "[silver colloid nanoparticles] showed high antimicrobial and bactericidal activity ... including highly multiresistant strains ... A very low concentration of silver (as low as 1.69 mug/mL Ag) gave antibacterial performance." "Silver is a disinfectant for non-spore forming bacteria at concentrations about 1000 times lower than the levels at which it is toxic to mammalian life. ...The ionic form of silver is necessary"
* These statements have not been evaluted by the Food & Drug Administration. Advanced Silver Company products are not intended to diagnose, treat, cure or prevent any disease. Opinions expressed by the following websites are not necessarily those of the Advanced Silver Co.
FDA Says BPA is Safe?